Size: 14 x 17 inches. From: John Harris's 'Navigantium atque Itinerantium Bibliotheca: or a compleat collection of voyages and travels' (London:1705). See Mead Cain's article on the Morden maps in The Map Collector Issue 57. 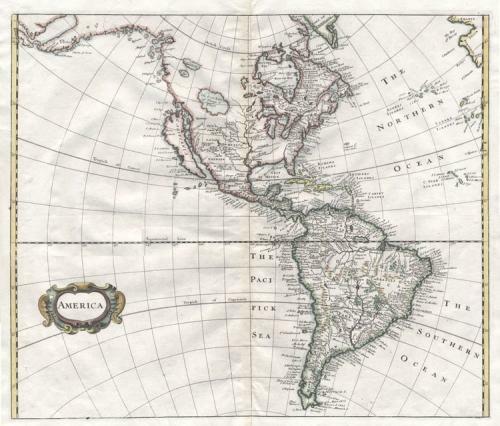 A very interesting map of the Americas that was probably engraved by Herman Moll, based on a Robert Morden map done for Peter Heylyn's Cosmography of 1703. As recently as 1991, this map was unrecorded. The map has many interesting features and presents a view of the continent that was unusual even in it's day: a fictional "The great lake of Thonga or Thoya" drains to the Pacific. The Pacific coastline is completely fabricated and the Mississippi river is shown too far west and empties into the Gulf near the unnamed Rio Grande river. A large 'Parime' lake appears along the equator in Brazil with no outlets and a lake 'Xarayes' forms the headwaters of the 'R of Plate' flowing south past 'Buenos Ayeres'. California is shown as an island as was standard at the time. An interesting map that is in very good condition with wide margins for framing.